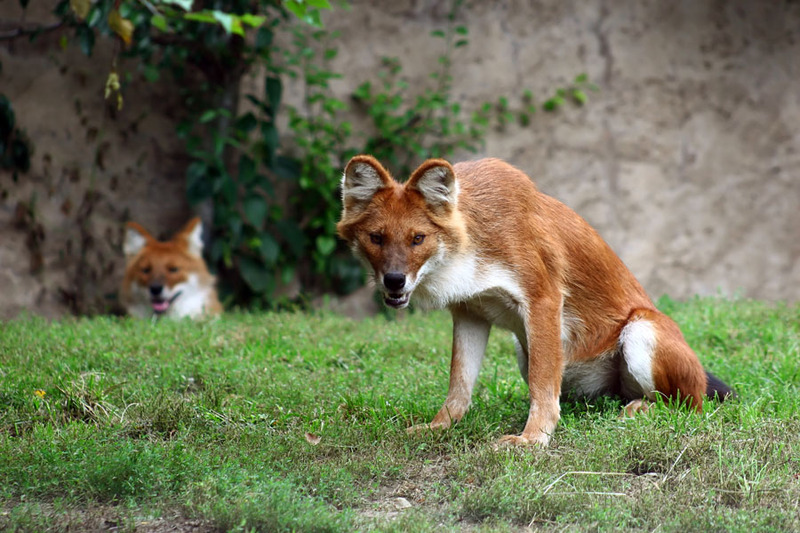 Dhole, also known as the Indian Wild Dog or simply Red Dog is a fierce predator. They hunt in groups and succeed in killing animals the size of a buffalo. They live in India, Southeast Asia and parts of China, Mongolia, Russia and Korey. These dogs are known for their excellent cooperation skills that allow them to prey on creatures many times their size. Dholes are medium-sized, reaching 76-112 cm in length and weighing 15-25 kg. Their fur is reddish, with hints of fallow, with a completely white underside. The tail is long, almost touching the ground and it usually turns darker near the end. Overall, the Dhole’s body is slender and athletic, giving the animal great agility and speed. Although Dholes prefer hilly areas with trees, they can survive in a variety of areas, for instance, in Tibet they live plateaus. Comparing to other species of dogs, Dholes are excellent in adapting to different climates and environments. They can survive in both cold mountain regions and hot tropical areas in the more Southern territories. These wild dogs live in packs of one or multiple families. Together they hunt large animals such as deers, buffaloes and wild hogs. Basically, they hunt any large animal that has enough meat to feed all the pack. Dholes are weariless hunters – they can chase prey multiple kilometres until the fleeing animal is so tired that it can’t defend itself. The key of success for them is cooperation, because when hunting, every member of the pack has a specific task, whether it is distracting, injuring or chasing the prey. After a successful hunt, the pack immediately takes the prey to pieces and eats it fresh. In warmers regions Dholes mate all year round. In the North, copulation usually occurs at the end of the winter. Females find a proper den and it’s not unusual for multiple females to share a single den. After a gestation period of about 60 days, 2-9 blind pups are born. They develop fairly quickly – they start exploring areas around the den in a month after birth and in six more weeks they become completely independent. Currently, Dholes are classified as “Endangered” by the IUCN red list of endangered species and unfortunately their population is decreasing every year. This is because they are still widely hunted for their fur, as well as protecting livestock. Very much harm is also done by destroying their natural habitat, and in some areas prey is also scarce. 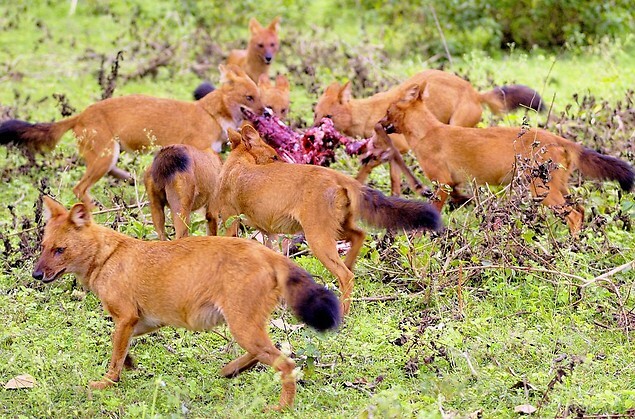 Unfortunately, nothing can be done to stop the population from decreasing, as disruption of natural balance has reduced the number of available prey for Dholes.